Popular culture has it that absinthe induces Kylie Minogue hallucinations, and Four Loko-esque reactions. Is any of that true? Well, I suppose if you have Kylie Minogue stuck somewhere in back of your brain, she might show up as a hallucination, but I think any good, decent shot of scotch could do that too. As for Four Loko-esque reactions, I would say absolutely not. The ingredients are completely different. I am told that Four Loko has caffeine and a mix of other stimulants. Absinthe has grand wormwood, which is a very different product. What does it taste like then? Properly mixed, absinthe should have a very pleasant, slightly sweet, herbal flavor. If a more encompassing physical image would help, many people compare it to what you might smell or feel lying about in a spring meadow. What’s the worst that can happen from drinking too much absinthe? The same thing that would happen if you drank too much of any spirit. You’ll wish you hadn’t, in the morning. When did you start drinking it? And why is there such mystique around it? 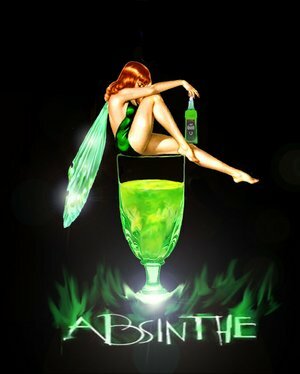 I experienced my first real absinthe when it became available in this country a couple of years ago. It was not easy to find, and at that time only one or two brands could be had. One of them is the absinthe marketed under the name “Lucid,” which is the French brand that overturned the US ban on the spirit. As far as the mystique, first, even though it has been around since the end of the 18th century (about 1790), the liquor gained it greatest popularity during the period known as the Gay 90’s in Europe toward the end of the 19th century. The ingredient known as grand wormwood (Artemisia absinthium), a herbaceous, perennial plant native to Eurasia and North Africa was reputed to have hallucinogenic or psychoactive properties (later disproved), and became a favorite of many late Victorian or early Edwardian writers, artists, musicians, and literatti of all persuasions (Vincent van Gogh, Oscar Wilde, Toulouse Lautrec, and Sir Arthur Conan Doyle). I suppose you could say that the drink’s alleged “magical” properties plus the fact that it was enjoyed by so many legendary characters have greatly contributed to the green spirit’s mystique.